Cadillac CTS-V Sport Wagon | What Car? Estates are all about space, and at 720 litres of luggage space with the seats in place, the Cadillac CTS-V Sport Wagon is big. Its boot is bigger than that in an Audi A6 and BMW 5 Series. Fold down the seats and it still does well against its German rivals with a generous 1644 litres, although a Mercedes-Benz E-Class estate is bigger still. Click below to watch our video from the New York motor show. The CTS-V Sport Wagon isn't just big on space - just take a look under the bonnet. It's powered by a huge 556bhp 6.2-litre engine, which can whip the Cadillac it from 0-60mph in just over four seconds. 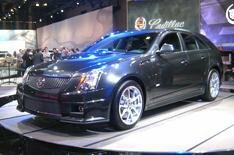 > Cadillac CTS-V 6: click to enlargeHow much and when? It's on sale towards the end of this year and will cost from around 60,000.